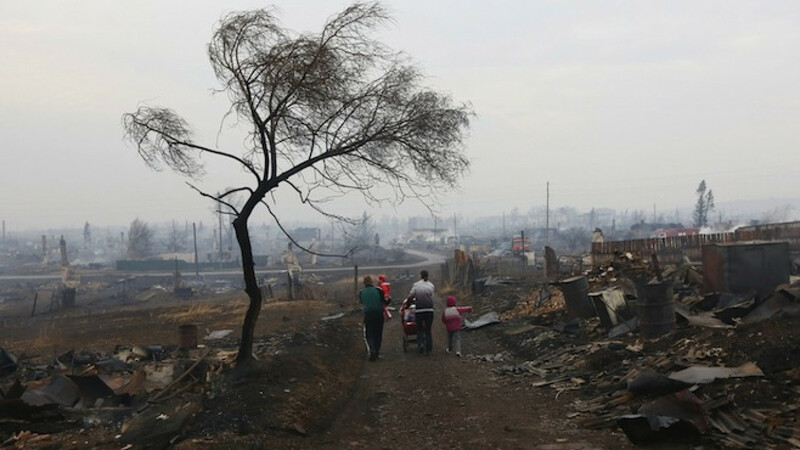 Family members walk away while passing the debris of destroyed buildings in the settlement of Shyra, damaged by recent wildfires, in Khakassia region, April 13, 2015. Hundreds of people in southern Siberia took refuge in temporary shelters Monday after their homes were destroyed by forest fires that have left more than 20 people dead, officials said. At least 23 people have so far been killed by fires in the republic of Khakasia, the Interfax news agency cited Investigative Committee spokesman Vladimir Markin as saying Monday. More than 900 people have suffered injuries, according to regional authorities. Almost 1,300 houses in 34 villages and towns across the republic have sustained varying degrees of damage from the fires, the regional authorities said Monday in an online statement. Some 5,000 people have been rendered homeless, news agency RIA Novosti reported. Shelters have been opened to help those affected, the regional administration said in a separate statement, and by Monday morning the shelters were housing 567 people, including 177 children. The fire was apparently caused by the careless deliberate burning of dry agricultural land, officials said. Alexei Yaroshenko, a forest expert at environment conservation activist group Greenpeace, told the Govorit Moskva radio station that Emergency Situations Minister Vladimir Puchkov and regional Governor Viktor Zimin should be held responsible for the deadly fires. 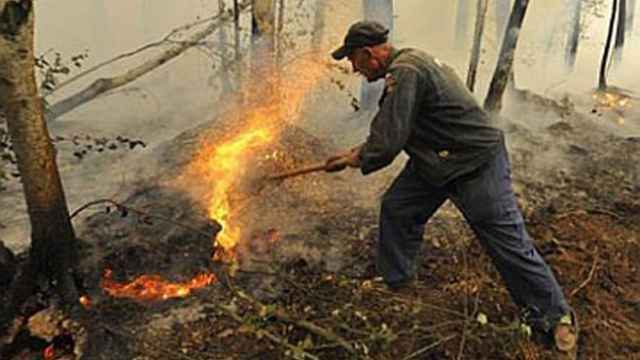 “We need to punish those who did not adopt systematic measures to fight the burning of dry grass: our Emergency Situations Minister Puchkov first and foremost," Yaroshenko said. "The establishment of fire safety measures for the burning of dry grass was commissioned by the president two years ago. The blame lies above all with the Emergency Situations Ministry and, of course, with the head of the region,” he said. The Federal Forestry Agency has also accused regional authorities of mismanaging the crisis, saying in a statement Sunday that they had failed to adopt the agency's recommended measures on preventing wildfires. While controlled burning of fields is often done by farmers to promote crop growth, abnormally dry weather in the region has contributed to the fires getting out of control. Five criminal cases have been opened in connection with the fires, including charges of negligence causing the deaths of two or more people, Interfax cited Markin as saying. The republic of Khakasia will observe a day of mourning on Tuesday, regional authorities said.